“Can you describe to me what your social life is like at site?” I eagerly asked a fellow Peace Corps Thailand Volunteer at our joint swearing in/close of service ceremony. “My best friend at site was a sixth-grade girl!” another Volunteer chimed in. I was annoyed not only by the interruption but also by the idea. 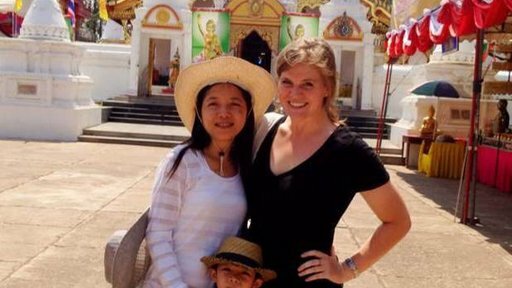 Peace Corps always touts the relationships Volunteers build with people from the host country. Surely my best friend wouldn’t be a sixth-grade girl. Surely I would have a real friend. Two months passed. My principal and his family had taken me on a trip to visit his wife’s parents in a neighboring province and I had just been informed that they were bringing me back to stay at their house for the night, where apparently I would be staying with his sixth-grade daughter, Noon. “Tonight, you will sleep with my daughter!” my principal announced happily. His wife wheeled around from the front seat to grin at me. As I lay stiffly in bed next to an equally stiff Noon, I thought about the Volunteer with the sixth-grade friend. Instead of feeling superior and judgmental as I had initially, I felt envious. I couldn’t even get this sixth-grader to be my friend. When I had arrived at my host mother’s house a couple of months earlier, she told me she had two college-aged daughters who came to stay on weekends. I was thrilled. Most of my friends were college-aged girls! I wondered if I should make the best friend bracelets beforehand, then figured I would wait to learn their favorite colors. What shenanigans we would get into for me to recount years later at their weddings – in fluent Thai, no doubt. This was going to be great. It quickly became clear that no best friend bracelets would be necessary. Apparently, I was living in the room where Ae and Aom usually stayed, which meant they were exiled to the living room. During our first dinner, I strained to make conversation in Thai but they remained fixed to their phones, ignoring the strange woman who lived in their room and wouldn’t shut up about varieties of fruit. The teachers at my school were incredibly nice but as with everyone at my site, I never felt that I could truly be myself. It was a huge departure from my life in America, where no thought was left unsaid and my friends and family were subject to a litany of complaints and observations throughout the day (subject lines from the “Friends” folder in my Gmail include “Ha!”, “Plz advise” and “Um bonjour?”). And while it was probably the best for my community and, honestly, humanity as a whole, it was lonely and draining. I was surrounded by kind, giving people who took great care of me, but I didn’t feel close to anyone. A few months later, my co-teacher flew into our classroom, flustered. She took her head in her hands and inhaled deeply. She hurried away to make her preparations and I sat smiling in my chair, feeling like I had just found a pearl, a beautiful, delicate pearl of rage. Kru Jiw has the best English at our school, self-taught from reading the Harry Potter books. She’s 41, divorced, has a 14-year-old daughter and loves puns. She’s smart and honest, and always keeps me in line (“You don’t say it like that” and “You’re supposed to do it like this” are some of her most common phrases). She carries around an iPad to translate things when she can’t express them... and to play Bejeweled. She has me over to her house to talk and play Uno with her daughter. She told me that she doesn’t like America because of what she sees on the news, but that she likes me. 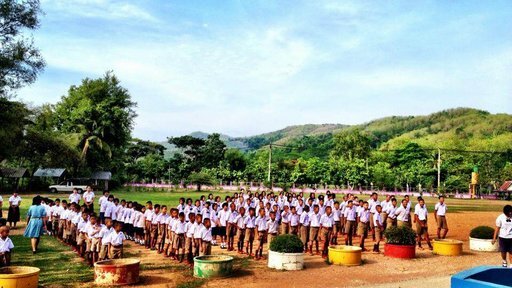 A few weeks ago, Kru Jiw, a few other teachers and I went to visit another province. That evening, as Kru Jiw drove me home, I was slumped against the window, exhausted. I peeled myself off the window and rubbed my eyes. I smiled. I did it. I had a friend. Madeleine Aggeler is from Washington D.C., and graduated from The College of William and Mary in 2013 with degrees in History and French. 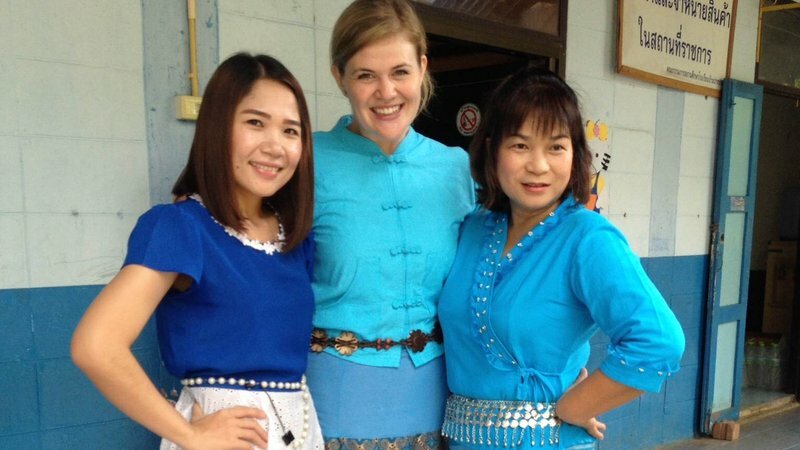 She is currently serving as a Teacher Collaborator and Community Service Volunteer in northern Thailand.